While a tree that will rain money down on you might not exist, you CAN increase the value of your property by updating your landscape design, and increasing your curb appeal. Studies have shown the right updates to your landscaping can increase your property value by 10-12%! While it make sense to make an investment in a well thought out landscape, there are some steps you can take to make sure you make your budget stretch. Decide what you really want. Make a list of everything you would like to do in your outdoor space. What are the ways you will make use of your outdoor space? Do you love to entertain? Consider an outdoor kitchen or a firepit for your friends and family to gather around. Do you want to lounge in a scenic, serene atmosphere on the weekends? Think about adding plants as well as rockwork, possibly a patio for you to sit on and enjoy nature. The important thing to remember during this step is to include anything you might want to include in your space. Some of your dreams may not be feasible at this point, but you are forming a basic idea of what your landscape can become. Set a budget. It’s time to decide what you are willing to spend on this project. Remember, the improvements you are making to your home are going to increase the value of your home, but, more importantly, you will be improving the quality of life you spend in it! Bring in a professional. You will be tempted to do all the work yourself, but unless you are well-versed in every aspect of bringing your design to life, it’s a good idea to at least talk to a professional before you begin. Remember that you are not just planting a couple of plants and calling it a day here, you are creating a space comprised of plants, grass, and most likely rock work. You will need proper drainage and irrigation to keep your plants beautiful, and it’s best to get the input of a professional for anything that might be out of your wheelhouse. Hiring a professional may seem like a large expense, but remember that fixing a problem after the fact will most likely be more expensive! No matter the size of your project, or budget, a bit of landscaping will improve your curb appeal, and make your home a delight to drive up to. 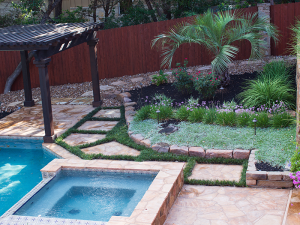 Contact ECO Irrigation and Landscaping to plan the outdoor space of your dreams!